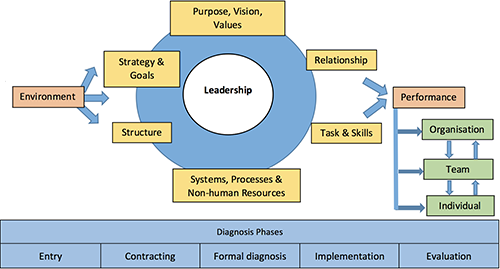 Diagnosing can focus on understanding organisational problems, including their causes and consequences and identifying the organisation's positive attributes. It includes gathering, analysing, and feeding back information to managers and organisation members about the problems or opportunities that exist. Data can be gathered through interviews, observations, survey instruments, HR metrics, or sources such as meeting minutes and organisation charts. The model below can be used as a guide to diagnosing performance improvement aspects at an organisational, team or individual level. The model outlines areas of consideration that could impact effectiveness. By delving into each of these areas by asking the right questions, it is possible to get a full picture of what is going on to enable a holistic diagnosis and integrated solution. External forces which affect ECU’s or the group’s objectives or performance directly or indirectly such as legislation, the economy and labour market, stakeholder relationships, employer and industry needs, emerging technologies and social change. The purpose defines what the organisation is all about. At ECU the purpose is to transform lives and enrich society through education and research. The vision clearly and concisely communicates ECU’s long term goals. The vision is for ECU to be recognised for its world-ready graduates and world-class research. Work towards the goals needs to be undertaken in accordance with the ECU values of Respect, Integrity, Rational Inquiry and Personal Excellence. The extent to which the organisational members are clear about the organisation’s purpose, vision, and values expressed in behaviours is important to achieving ECU’s goals. The plan(s) devised to maintain and build sustainability, growth and competitiveness to ensure the vision is achieved. The arrangement and resourcing of functional areas and operational units, that signify levels of responsibility, decision making authority, lines of communication, and relationships that lead to implementation of ECU’s strategy and goals. Policies, procedures and resources that are designed to help and support ECU’s employees with their jobs and role responsibilities. Includes the appropriate amount of equipment and resources needed to achieve the organisation’s goals. Understanding what a specific job position demands and the kind of knowledge, skills and abilities that an employee must have in order to fulfill the task responsibilities of their role. It’s important to see how well jobs and employees have been matched. Between individuals, and between schools or departments that perform different tasks and have developed their own individual cultures. This includes the level of required interdependence, quality of relationships, and how conflict is managed. This category is usually associated with the behaviour of senior executives, however at ECU this also relates to supervisors and managers. By leadership we mean, providing direction, persuasion, influence, serving followers and acting as a role model. To what extent can ECU’s leaders set direction for the future, drive the implementation of strategy, manage uncertainty, deal with complexity, effectively manage risk and deal with complex financial, people and change management issues? The outcomes and results of all the organisation’s activities that in turn are responses to the external environment (input). It includes organisational performance, stakeholder satisfaction and productivity. What are the key environmental forces impacting ECU? Who are your team’s key stakeholders and how do they impact you and the team? How does your team adapt to changing market conditions? How is ECU achieving its vision? Is your team fulfilling its purpose? How do shared values play out in daily life? What is the organisation’s strategy trying to achieve? What is distinct about this team? How is information shared (formal and informal channels) across the organisation? How is the team organised? How is information shared (formal and informal channels) within the team? What are the primary business and technical systems that drive the organisation? What systems impact your work (positive and/or negative)? What internal rules and processes does the team utilise to maintain course towards meeting its objectives? Is there clarity and consistency around job roles and titles? Is there clarity and consistency around job roles/tasks and titles within the team? Do the skills and capabilities of the employees match the job roles? What is the relationship between the UE and other employees? What is the level of trust amongst team members? How is conflict managed amongst team members? How do employees respond to senior management/leadership? How does leadership style impact your work (positively and negatively)? What behaviours, tasks and deliverables does the team leader reward? How do you ensure that you collaborate with customers to meet ECU KPIs. How are your outcomes linked to the organisational/team objectives? What prohibits you from delivering on agreed outcomes?